Ever since I was small my grandmother has had a glass cabinet filled with Japanese dolls and figurines. I used to spend hours at her house, memorising the shape and colours of each one, fascinated by how beautiful they were. Sometimes my grandmother would let me play with the tiny porcelain frogs that sat there. The green glaze sat darker in the crevices and they were so beautiful and delicate to me. My diet has always included the staples of rice and nori, usually with a healthy serving of furikake, which was nicknamed ‘sprinklies’ in my house. We’d ration them like treasures because Napier didn’t have a Japanese food mart, so our supply would come in care packages from my aunt who lived in Auckland. When our local supermarket brought in a Japanese shelf to the international food aisle we were overjoyed, and we could have an entire serving of furikake per meal instead of a tiny hint, and I’d eat nori in sheets as a snack. I had a Japanese doll in a Kimono. The fabric was a beautiful blue and her hair was so soft. I could never tie her obi quite right after I foolishly undid it, and her hair ended up with a kink in it that would never quite flatten. Plastic katanas, lone copies of ongoing manga anthologies, cassette tapes of nursery rhymes, a small and ratty popup book with Japanese I couldn’t read. This was my exposure to Japanese culture as a young child. I was fiercely proud of it. At the same time I hated the things about my own face that in part came from my Japanese heritage. My dark hair and eyes caused me constant anguish throughout primary school, where I desperately wanted pretty blonde hair and lovely blue eyes. I cried a lot. As a teenager the dark hair on my body made me feel anxious and ugly. The thick strands blended into a forest across my forearms, reminding me that no matter how much I plucked, shaved, bleached, waxed or stripped, the truth of my other-ness would seep out again, exposing my very DNA for anyone to look at. I found comfort in the language. Japanese is so beautiful to look at, and it felt like a big hug to learn. I was connecting to a part of myself. They say you carry the experiences of your grandmothers within you. I know it’s meant in a scientific statement relating to significant trauma being read in your DNA, but I like to pretend there’s something poetic inside me, like a compass needle that pulls me towards magnetic north. When I am learning Japanese I feel it tug. I am grateful to the times I have spent learning Japanese, but the experience in a New Zealand classroom always felt strangely artificial to me. The language is cut up into chunks that didn’t make sense to me and called curriculum. My own knowledge of Japan and Japanese-ness was brushed aside and discarded as irrelevant in the context of the classroom. What I knew was small and inconsequential and not Proper Japanese Stuff. I learnt the language in the same way my white and English-speaking classmates did, and this little bit of exposure created an imperfect filling to connect the fragments of Japanese I knew from my own life. I have only visited Japan once. A month in Hokkaido in January, staying with my aunt. I was sixteen and freshly diagnosed with depression. I didn’t know much of anything, but those few weeks helped cement something in me that has stayed solid ever since. Just little things in the eyes of anyone else, I’m not sure I could even properly describe it. I’d use images like kotatsu, tatami rooms and the soft un-sound of proper powdered snow. I found something there, in between the sushi and shu-creams and television shows. It’s a little space that was empty before, but afterwards it knew that there was a piece of me that belonged to Japan. Not just as a part of my heritage, but as a part of myself. My life is in New Zealand, and I’m not sure if I will ever be brave enough or lucky enough to live in Japan like I imagined I would at sixteen. However, I am still connected and just because I might never call the land home, the culture is still a part of me. My time working in a Japanese-run sushi shop helped me to connect my life in Wellington to Japan, exposing me to Japanese language in a practical setting for the first time in my life. I found a lot of my clumsy cut-up school Japanese flooded back to me, and I was able to understand quite a lot more than I imagined. By the end of my time working there I was proficient at understanding enough Japanese to make and sell sushi. Since then I’ve tried to be more active about what I expose myself to and connect more with other Japanese diaspora online, or at least quietly listen to them when they post. I am currently learning Kanji. It makes me happy in a way that I can’t quite explain in words. It’s that little ping, heading me towards magnetic north. Having a mixed racial identity can be confusing, especially if like me your cultural marker points have been thin and spaced out. I have been lucky to have the kind of support that I do, to have white-passing privilege 99% of the time. My anxieties are mostly personal and internal, which is a luxury because I can choose to untangle this knot on my own time whenever I feel like it. I always assumed that learning and knowing kanji would be an unobtainable dream, something I would never be able to find the time and structure and energy to achieve, even in the slightest. Having the ability to finally come back and unlock this door after so long waiting and wanting to is a rare gift I am grateful for. Occasionally a word I know turns up in its grown-up kanji clothes and something clicks into place in my head. My years of exposure to the word flood back to me across time, from my childhood to know, and I am learning the true form of something that has always been a part of me. In another couple of years I will be able to read kanji, and I am looking forward to further unlocking the doors that I know are waiting for me behind this first one. Girls like video games, but video games don’t always like girls. In fact, video games can be an actively hostile environment towards girls, and it starts young. But that isn’t universal and there is a growing trend towards great games that encourage and support girls as players. I’ve compiled a list of a few titles I’ve personally enjoyed throughout the year. As a disclaimer, these are all games I have personally liked or enjoyed in the last year, this isn’t the be-all and end-all list of games for girls. Some of these games feature some problem or other, they don’t necessarily have feminist values and they aren’t girls-only games. They are games that can be enjoyed by people of all ages and genders. Please also take my age suggestions with a grain of salt. All children are different and have different environments/needs/parents. 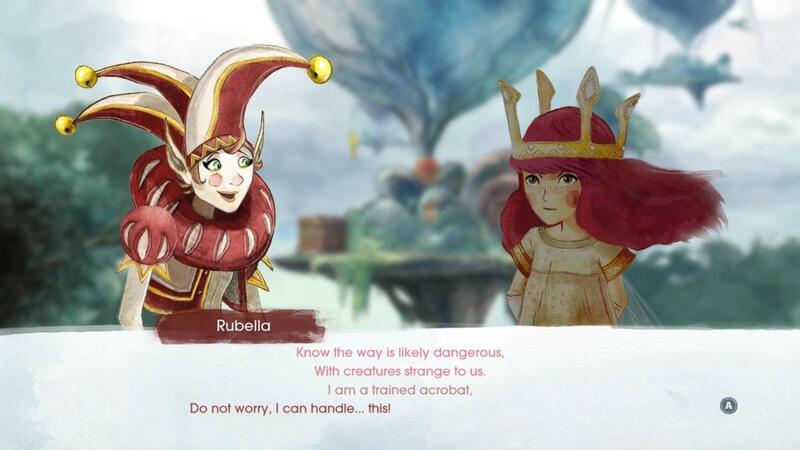 Child of Light is a fantasy RPG about a young princess and her adventures in a magical land. With an absolutely gorgeous illustrative style and an engaging yet traditional battle system, Aurora is clever and powerful, and her adventure helps her to grow and discover her strength. Sounds pretty standard for an adventure game, yes? It is, until you realise girls never get to do this. Well, never is a bit of a stretch. But it’s definitely almost never. So close to never it deserves highlighting. Child of Light feels like a game I have played before, but instead of being relegated to a secondary character as usual, I am the star of the show. I don’t think I have ever played a game so absent from casual sexism. 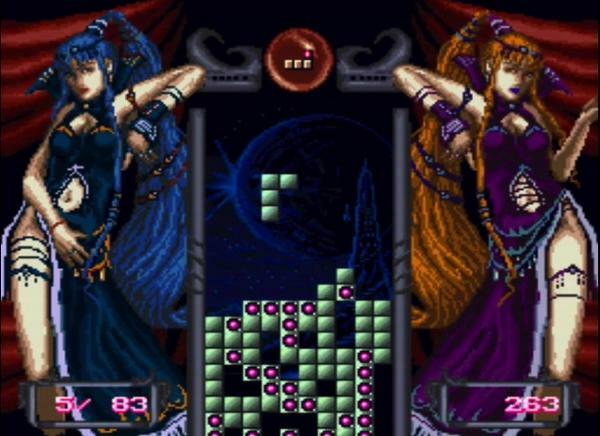 Considering that even Tetris can be sexist, this is a notable achievement. When playing video games I’m constantly waiting for something to spoil or tarnish my experience. Some sexist comment, eye candy character or death-for-the-sake-of-story. I have learnt after years of gaming that it is far too much to ask for a game to be free of sexism. It doesn’t matter if it’s a game meant for children, sexism makes its way in there. Child of Light never had this moment, and that’s a part of what made it such a special experience for me. Two hours in I realised my party featured more girls than boys and my heart did a little excited flutter. Even in female-led games, the protagonist is so often alone. Being one girl in a strong team of girls felt magnificent. We were the warriors, the mages, the jesters. We were varied, which made us strong. With so many women to design there was no chance for the “token girl” trope to take hold. Instead the game features deep characters with personalities and motivations wholly their own begin to emerge. I can’t remember if I have ever played another game where every single major character was a woman or girl. Every. Single. One. There is something so powerful and deeply comforting about all the major protagonists and antagonists being women, I’m not sure I can ever fully articulate how special this experience was to me. I guess this is how boys always get to feel. 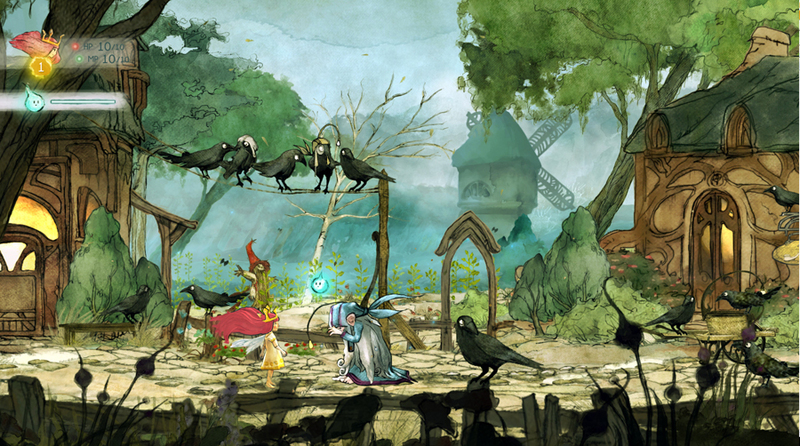 Child of Light received criticism for being the same old RPG thing. For me that’s exactly why I liked it so much. It’s the kind of game boys have always had, but finally I’m being recognised as a member of the audience. Broken Age Act 1 is a point and click adventure/puzzle game from Doublefine. Doublefine make excellent games and pretty much anything from their studio is going to be great, but I’m going to mention Broken Age here specifically because of Vela. 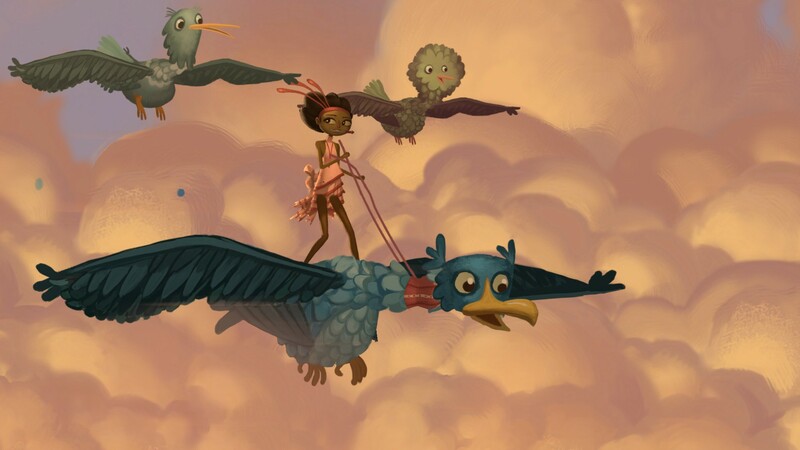 Vela is one of the two main characters in Broken Age, and she is AWESOME. Vela gets the action storyline. She is hungry for revenge and her whole storyline is shaped around killing the monster that terrorises the local villagers every year. The monster reads as an allegory of the patriarchy with the villages offering up their girls to the monster as a sacrifice. When Vela tries to draw attention to how this is wrong and young women shouldn’t have to be sacrificed, she’s told that no, this is how it is and how it has to be. Vela has ideas of her own, though. Concepts like revenge and action are typically ideas applied to boy’s stories, so it’s interesting to see them applied to Vela. Vela’s story isn’t masculine in any way, she remains feminine – dressed in pink and speaking softly, she solves puzzles by talking to people, earning trust and using her wits to get the things she needs. However, she is still a warrior and never at any point does she lose sight of her goal. Not afraid to break rules when she needs to, Vela’s half of the story is interesting, funny, and compelling. Vela’s story is only half of Broken Age. Shae’s story is just as good. Since he’s a boy, I’m not going to write about him here. There are plenty of other reviews that talk about both of them. 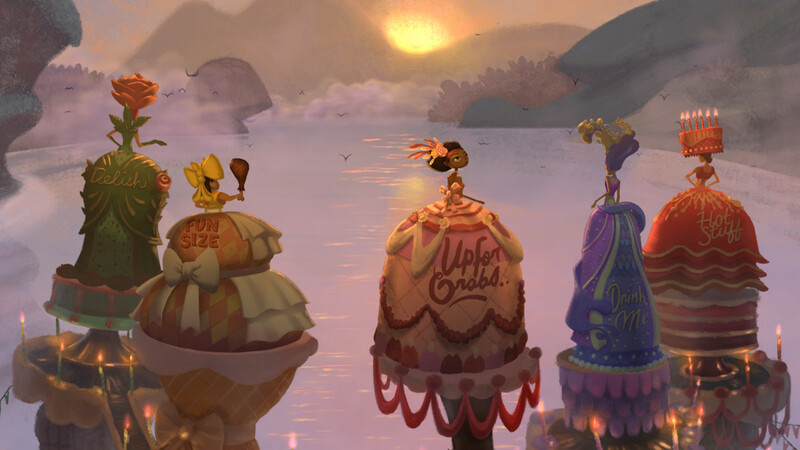 Broken Age Act 1 is the first part of a two part series, but it plays well alone. The second half is in production and will be released at some magical point in the future. Jem’s suggested age range: 8+ without assistance, any age with a helpful person to guide them through. 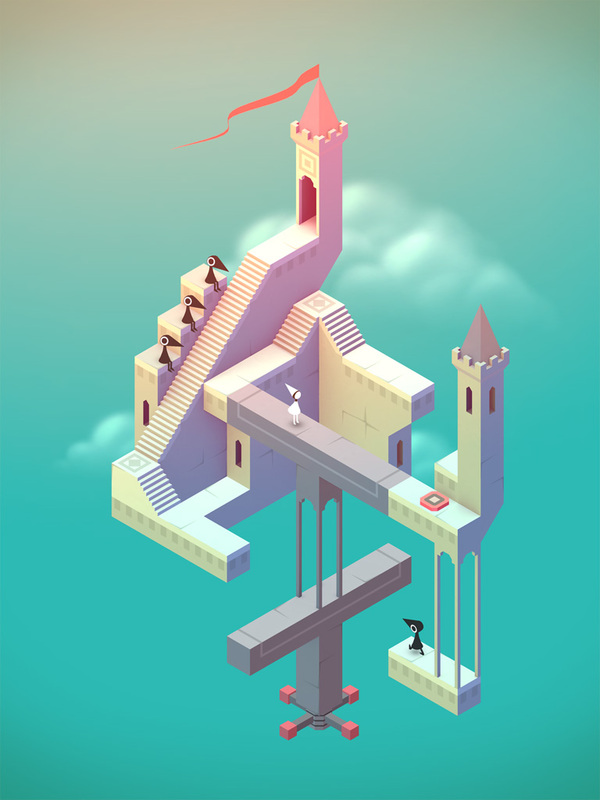 Monument Valley has been the darling of iOS gaming this year, and rightly so. A beautiful perspective puzzle game, the character guides Ida around the world, adjusting the Escher-like perspective to guide her path. The narrative is light yet powerful, the environments themselves carrying the bulk of the storytelling power. Ida’s adventure is about an hour long (and the expansion of an extra 9 levels about the same) which is the perfect length for a game like this. I had a delightful time playing through this game myself, but nothing was more awesome than sharing the game with my 7 year old cousin. She was completely mesmerised by it. And even when she complained that it was ‘too hard’, usually she wasn’t more than a minute or two from solving the next step of the puzzle herself, which made her squeal with delight. My mother, who has always been a huge supporter of play and video games but never a player herself, is happy to say that Monument Valley is the one game she’s played. So, Monument Valley! A beautiful puzzle game with a female protagonist and beautiful environments. I will likely always love Pokémon. It’s a very special series for me, which in some ways marks the start of my journey as a gamer. In the early versions you couldn’t play as a girl, but your character was so pixelated it didn’t matter much anyway. Better to play as a boy than to not play at all, that was for sure. The early games were an amazing adventure, and as a 12-year-old kid they made me feel powerful and connected. I was a part of this amazing world. You become quite connected to your team, who you train, choose abilities for, and battle with to defeat tough opponents or capture new potential team mates. It did bug me that so much of the interaction was based around fighting. I wanted to hang out and get to know my companion pokémon for more than just their strength. 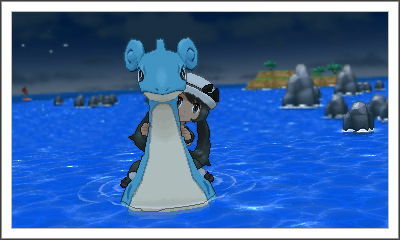 Later versions and spinoff titles of the franchise have expanded the world and given players a range of ways to engage with the lovable creatures – from photo games to card games to puzzle games. In the main titles some pokémon now evolve based on their friendship level with you, and a strong friendship bond earns special bonuses. It’s not surprising that pokémon who evolve in this way end up being some of my favourite teammates. 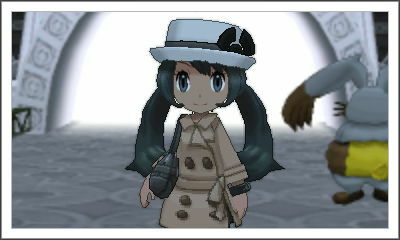 The versions of Pokémon released last year (X and Y) cultivate a rich experience where you can customise your gender, appearance, hair, and outfits. I was sad that this flexibility hasn’t carried over to this year’s re-release of Ruby and Sapphire (Omega Ruby and Alpha Sapphire), and that your character choices have boiled back down to only gender options (Pictures here are screenshots of my character from X and Y). However, I am still playing Ruby and really enjoying the blend of features from the previous games with the locations and pokémon from an older generation. The interesting thing about this current generation of Pokémon titles is the way you can connect with others. It’s almost like a background to the game. If you want you can stay connected the whole time, getting boosts from other players from all over the world, conducting mystery trades or even battling other players. Your identity is at least partially anonymised and there are only a set number of phrases you can use to communicate to prevent harassment. Players can easily choose what kinds of engagements they want, and opt out of the kinds they don’t want. It’s also very easy to not engage at all if the feature is unwanted. As a fiercely solo player in most of my gaming spaces I was surprised how much I enjoyed the online aspects of the game. It was especially nice to play alongside my younger brother, who played my old Pokémon cartridges after I abandoned them. This list was originally 10 games long, but that seemed a bit excessive for one post. If you like these little game reviews, please say so! I can certainly write more.